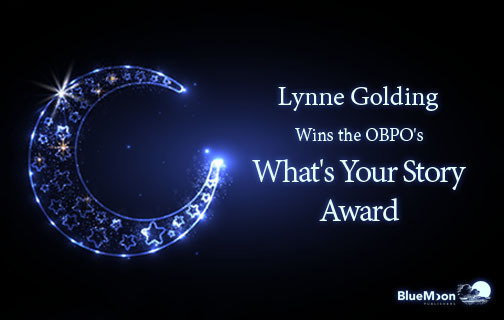 We’re proud to announce that our new literary author Lynne Golding has been selected as one of the winners of the Ontario Book Publishers Organization‘s “What’s Your Story?” contest. This writing contest selected a mix of four emerging, unpublished, and established writers from three Greater Toronto Area neighbourhoods. The winning pieces will be published online on open-book.ca and in a print anthology, and will be performed at events throughout the year. The contest created an opportunity for me to interview people, which is rare for me as a writer of historical fiction. While the story I wrote is a fiction and does not reflect the personal circumstances of my friend, her daughter, or the person they helped, I did try to capture their feelings at the various points in the experience. Lynne’s debut novel, The Innocent, will be published by Blue Moon Publishers in October of 2018. Lynne will be presenting her award-wining work at What’s Your Story, Etobicoke? in partnership with Arts Etobicoke on Wednesday, May 16, 6:30 – 8:30 pm, at the Assembly Hall. She will be joined by fellow winners Teri Vlassopoulos, Mary Breen, and Andrew Anthony, and host Alissa York. Have you ever won a literary contest?